CHARDON, Ohio, Sept. 20, 2011 (SEND2PRESS NEWSWIRE) — e2b teknologies (www.e2btek.com) was named to Accounting Today’s annual VAR 100 list ranked at 77. This is the first year that e2b teknologies has been included on the exclusive list and is just one of many accolades received this year following a second appearance on the national Inc. 500/5000 list of fastest growing companies. 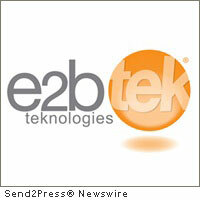 Earlier this year, e2b teknologies expanded its ERP portfolio adding SAP Business ByDesign. With SAP Business ByDesign, e2b teknologies now offers customers many choices when it comes to where they want their ERP software hosted, how they want to deploy it, and whether they want to purchase it or spread the costs out through subscription-based pricing. The company’s portfolio includes leading products from SAP, Sage, Epicor, and SingleSource designed for progressive professional and field service companies, distributors, manufacturers, and other organizations. e2b teknologies was recognized by Epicor earlier this year for having the highest customer satisfaction ratings among its Epicor 9 resellers and was also recognized by Sage as Development Partner of the Year for Sage ERP MAS 500 in July 2011.
e2b teknologies sells, supports and implements Epicor 9, SAP Business ByDesign, SingleSource SM-Enterprise, and Sage ERP MAS 500 enterprise resource planning (ERP) accounting software for distributions, manufacturing and service companies. Specialized solutions are available for automotive, HVAC and plumbing, food and beverage, high technology, professional services, and other businesses. Anytime Collect (www.anytimecollect.com) collections management and e2b 500 are delivered through its e2b software division. e2b software (www.e2bsoft.com) also provides customer cloud-based business application services. – RSS news feed for e2b: https://send2pressnewswire.com/author/e2b-software/feed .